World Mosaics 3 - Fairy Tales is rated 4.0 out of 5 by 13. Rated 5 out of 5 by vkreisel from Love this game series This game series is my absolute favorite that I've ever played, Definitely would play again! Rated 5 out of 5 by Fuphyter from AN AMAZING GAME!!! I am new to the "mosaics" games. I just started playing a few weeks ago. I LOVE this one. The game is divided into fairy tales. There are several mosiacs each. As you finish the mosaic it turns into a picture associated with the fairy tale and a book page beside it telling the story. I have been a member here for 3 years, mostly playing HO's. This game is more fun than some of the HO games. If you have never tried this kind of game, try this one out. I wish they had a second one!!! Rated 5 out of 5 by apt2bash from Cerebellum Treat Why not have a bit of fantasy while you visually map numbers in your head? I felt the same way, so I have enjoyed playing it immensely. This like the other Mosaic games aren't about a storyline, it is simply about challenging your spatial perception and having fun with it. Rated 5 out of 5 by Katiendan from One of My Favorites In this game you must repair an ancient book of fairy tales in order to get back to your own time and save another person who's been stuck in the book for hundreds of years. 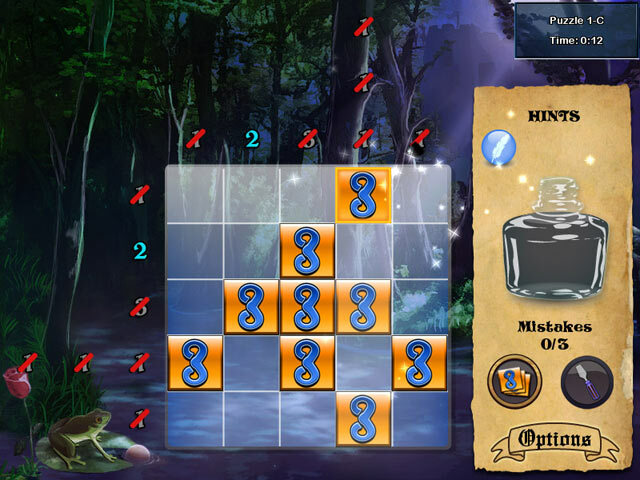 As with the other World Mosaic games, you are given a grid with numbers associated with each row and column - and it is your job to determine which squares/bricks to break and which to keep in order to complete various pictures and move forward in the storyline. One of the neat things about this game is that it includes several fairy tales I had never heard before as well as several twists to the fairy tales I do know. Overall, I would highly recommend this game to those who enjoy other mosaic and logic-type games. Rated 5 out of 5 by sueandjack from Waiting for 4 Great game! Makes you think-then think again. 10x10 can be easy but not always and then it really get fun. These games make you think. The five different ones are alike but not the same-each one is different enough to keep you want to get the next one. Rated 5 out of 5 by laid_back_ladies from Great game Great game. Challenging but not impossible. Good replay. 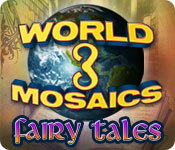 Rated 5 out of 5 by chunkychow from Favorite games The World Mosaics & the World Riddles games are my very favorites. They start very easy (so you will get the hang of what you are supposed to do) & then go on to be challenging & are good brain & memory exercise. There is alot of replay value because you would not likely remember what you did the first time & there are alot of puzzles in each game & then extra sets of puzzles. You really get your money's worth & I hope that BigFish will get World Mosaics 2. There is no "save" but each puzzle is between about 3 to 10 minutes unless you have to "play just one more!" Rated 4 out of 5 by arnold1049 from FRACTURED (?) FAIRY TALES You play this game as a person who is in search of various medallions/items that, hopefully, will finally get you out of this weird situation where you are thrown into the middle of various fairy tales. This game tells the story of 12 different fairy tales. Playing a grid brings up another part of the story. The number of grids that must be played to get to the end of the fairy tale are different for each tale. I remember one story (Sleeping Beauty) which took over 13 grids to tell the tale. I call these fairy tales "fractured" first because you must play a grid to get to the next part and second because I did not always recognize the story of the fairy tale as told in this game. In fact, there were a few tales that I had never heard of before playing this game. The grids start out easy, 5x5, but by the end of the game, the grids are 20x20. Hints are earned during game play and are not carried over from one tale to the next. 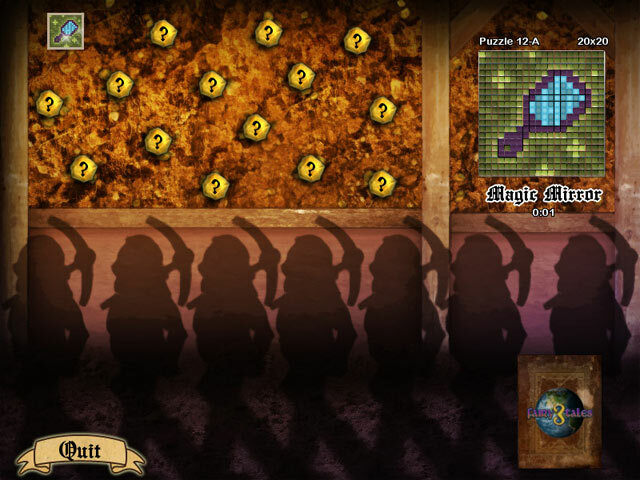 A maximum of 4 hints can be available, but after using one, you can earn another one. Eight mistakes can be made before you are forced to replay the grid. 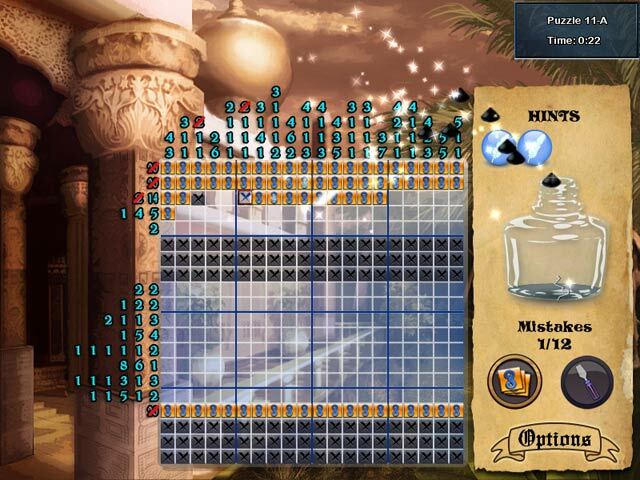 Game play is linear; you have to complete each grid in sequence before the next grid/tale is unlocked. A challenging game with an interesting take on many familiar fairy tales. Rated 4 out of 5 by Micklynn from Great for beginners I liked this game and think that it would be a nice game for someone that hasn't played this type of puzzle before. The game advertisement shows a 20x20 grid but I played the full demo hour; finished 4 whole fairy tales and almost 5 puzzles of the next tale. It was still 10x10 grids. The best part for me was that the game doesn't auto cross off EVERY number as its filled in, which lots of these games do. I often delete the game after only 2 puzzles. I might have bought this game for that alone if it had been more challenging. It just gets boring and too easy playing 10x10 for so long. Overall it was an alright game, and as I said, good for someone new to this puzzle type. I think it's worth the free download to try yourself; it was a fun relaxing hour. Rated 4 out of 5 by Rebr2009 from Instead of improving, worsened Much easier than the 1º e 2º . I liked but not loved. Just play once.